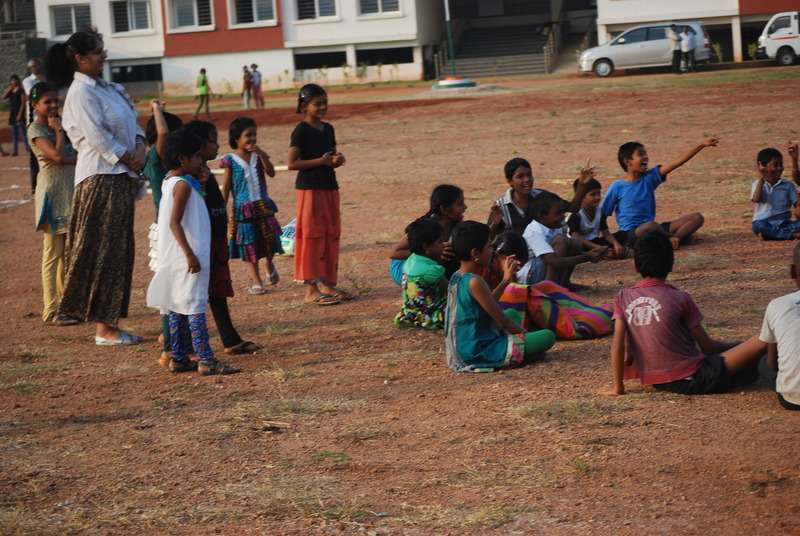 Kho Kho is an Indian game that is often played at HEAL children’s Village. To win the game a team has to tag all the opponents in the shortest time possible. 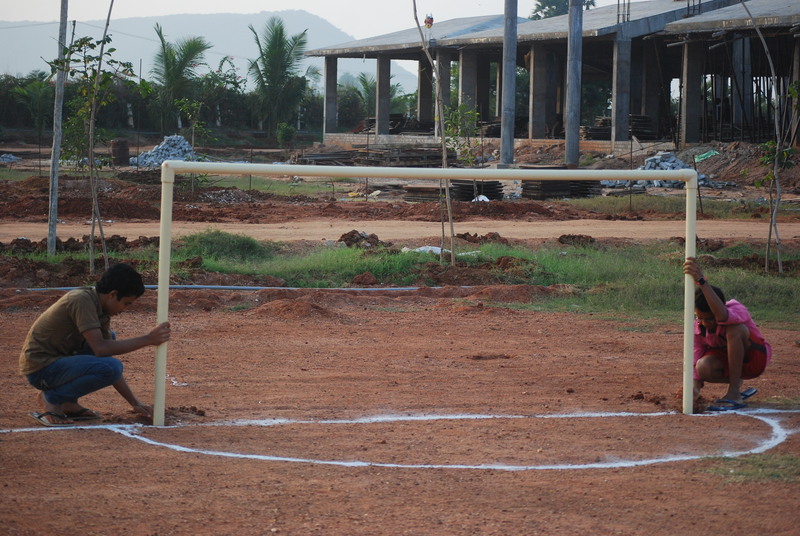 The game is played on a rectangular pitch which is usually 29 meters long and 16 meters wide. 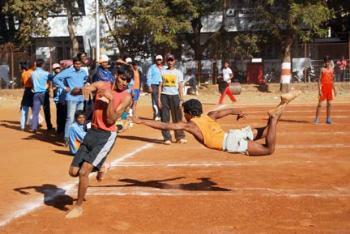 A kho kho team consists of 12 players but only 9 can take the field. A match consists of two innings. each innings consists of chasing and running for nine minutes each. One team (chasers) sits/kneels in the middle of the court, in a row, with ajacent members facing opposite directions. The other team (dodgers) play in batches of three. The chasers can only run in one direction and cannot cut across the sitters. The dodgers can run anywhere and can go inbetween the sitters. The chaser has to run around the entire row to reach the other side.The chaser can pass the chasing job onto a sitter whose back is facing the chaser as he/she is running. 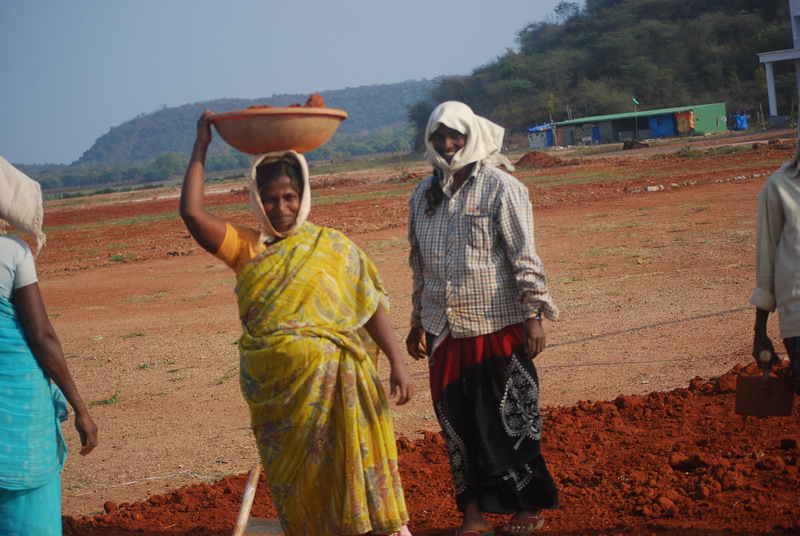 To do this the chaser touches the back of the sitter and shouts “kho” which signifies the change of chaser. The objective of the game is for the chasers to tag all the oponents in the shortest time possible. 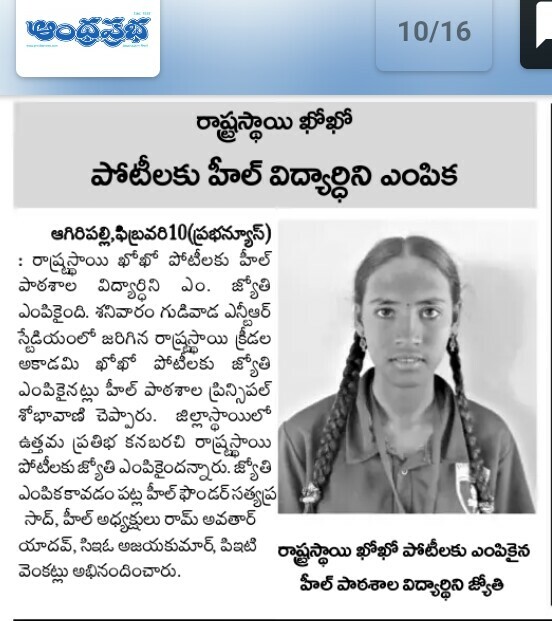 Lokesh and Ravi Teja report on Volley Ball. 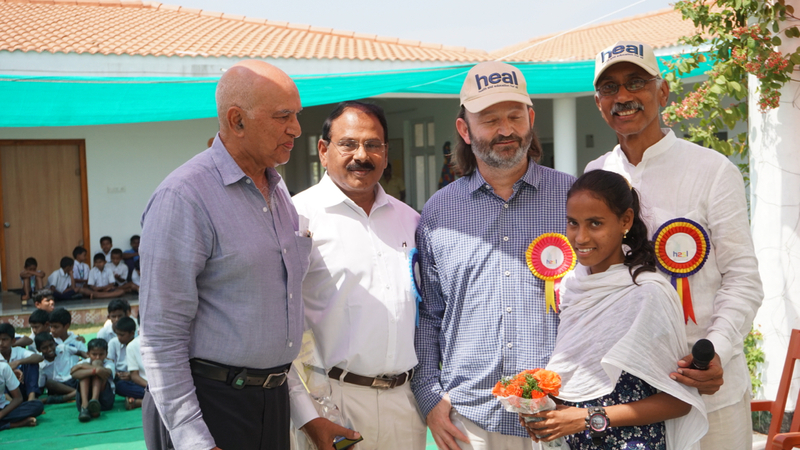 Volley Ball is played alot at HEAL Children’s Village by both the boys and the girls. Volleyball is a complex game of simple skills. The ball is spiked from up to 60 cm above the height of a basketball hoop (about 3.65 metres) and takes fractions of a second to travel from the spiked to the receiver. That means the receiver must assess incoming angle, decide where to pass the ball and then control their pass in the blink of an eye. 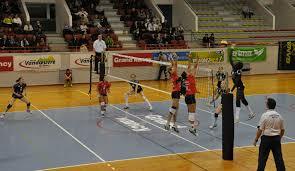 A purely rebound sport (you can’t hold the ball), volleyball is a game of constant motion. Volleyball has developed into a very specialised sport. Most teams will include in their starting line-up a setter, two centre blockers, two receiver-hitters and a universal spiker. Only certain players will be involved with service reception. 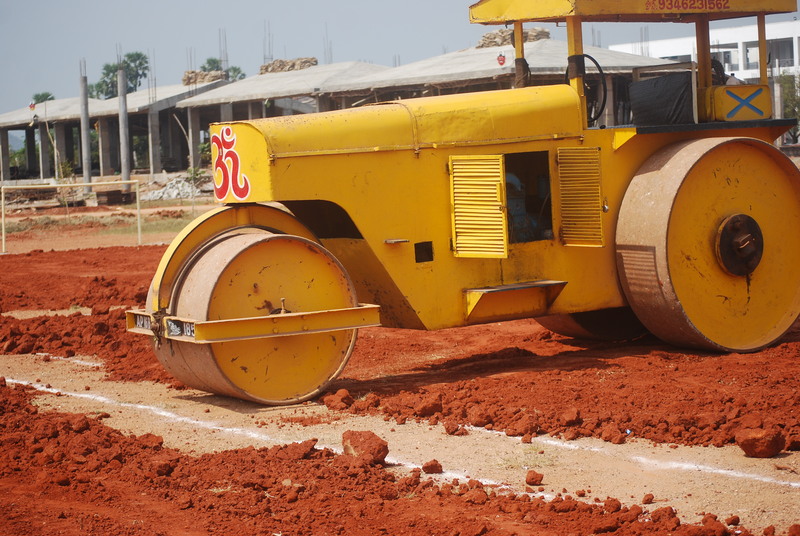 Players will also have specialist positions for attack and defence. Substitutions are allowed during the game. Since 1998, volleyball bas been using a new scoring system. Teams scored a point on every rally Point System), regardless of which team served. Formerly, a team could only win a point if it served the ball. Winning the serve back from the opposition was known as a side-out. Matches are played best of five sets. The first four sets are played to 25 points, with the final set being played to 15 points. A team must win a set by two points. There is no ceiling, so a set continues until one of the teams gains a two-point advantage. Previously, all sets were to 15 points, with the first four sets having a ceiling of 17 and the final set requiring at least a two-point winning advantage. In 1998, the FIVB introduced a new specialist role: the libero. This player wears a different coloured uniform from the rest of the team and can be substituted in backcourt for any player on the team. The libero cannot serve, spike the ball over the net or rotate into the front-line positions, but plays a vital role for the team in serve reception and backcourt defence. There must be at least one point played between a libero substituting off for a player and going back on the court for another player – hence he/she cannot be on the court for the whole game. The libero has added an extra dimension to backcourt defence, improving the reception of teams, lengthening the rallies and giving a vital role to shorter players. Volleyball, an Olympic team sport, is the second most popular sport in the world today. There are over 800 million volleyball players worldwide. In 1895, William G Morgan, a physical education director at the Holyoke, Massachusettes YMCA, created a game called Mignonette, as a low contact indoor sport. After observing the first game, Alfred Halstead, renamed the game Volleyball due to the volleying nature of the game. Numerous other variations of Volleyball have developed such as Beach Volleyball, Footvolley, Hoover ball, and Newcomb. Both Men’s and Women’s Leagues are popular, and there are many clubs and tournaments throughout the year in the US. A Volleyball team is composed of between 6-8 players on a team, and a match is played between two teams with an equal number of players. A volleyball court is 60 feet long and 30 feet wide, divided into two 30 30 ft halves, by a 40-inch wide net, placed so that the top of the net is about eight feet above the centre of the court. The first team to score 25 points (and be two points ahead) is awarded the set. Matches are best-of-five sets or best-of-three sets. 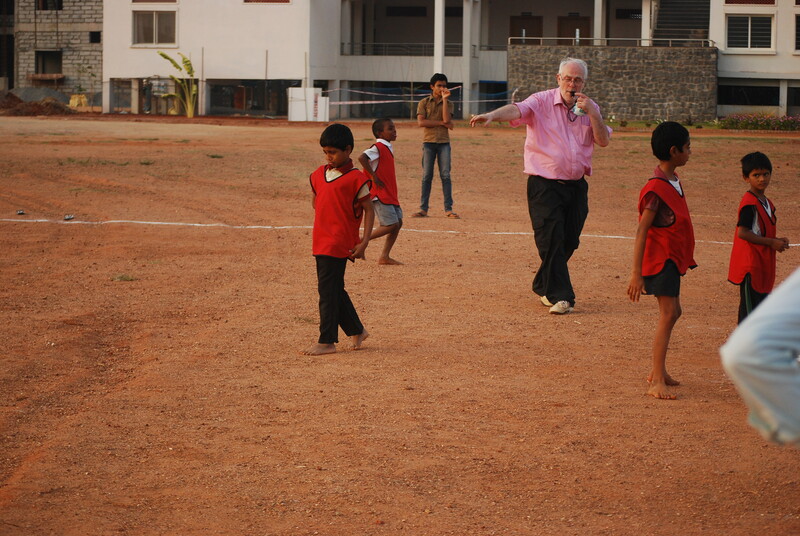 Cricket is a very popular game in India. It is played at HEAL alot. 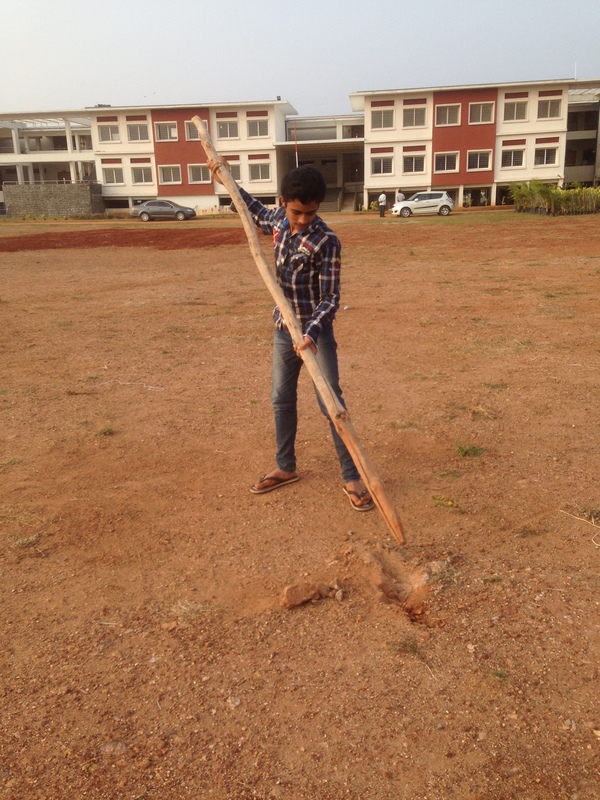 Cricket is a bat and ball game played between two teams of 11 players each on a field at the centre of which is a rectangular 22-yard long pitch. Each team takes its turn to bat, attempting to score runs, while the other team fields. Each turn is known as an innings. In professional cricket the length of a game ranges from 20 overs per side to Test cricket played over five days. The Laws of Cricket are maintained by the International Cricket Council (ICC) and the Marylebone Cricket Club (MCC) with additional Standard Playing Conditions for Test matches and One Day Internationals. Cricket was first played in southern England in the 16th century. By the end of the 18th century, it had developed to be the national game of England. The expansion of the British Empire led to cricket being played overseas and by the mid-19th century the first international match was held. ICC, the game’s governing body, has 10 full members. 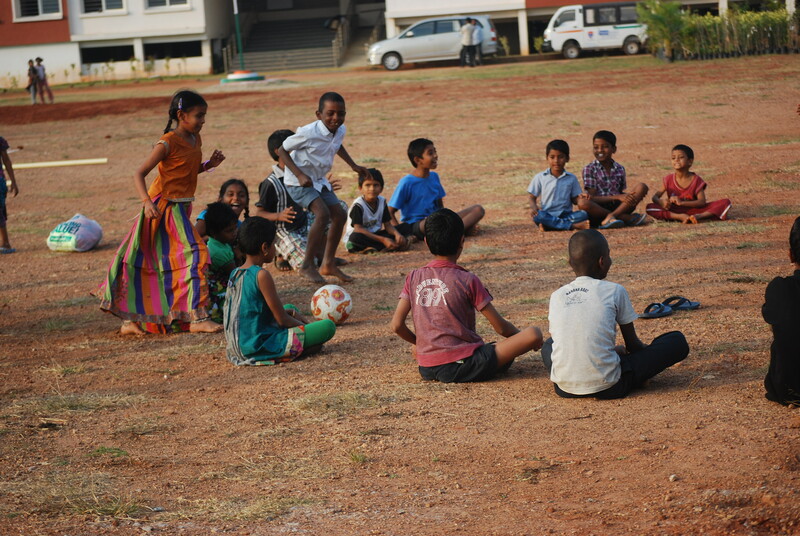 The game is most popular in Australasia, England, the Indian Subcontinent, the West Indies and Southern Africa. 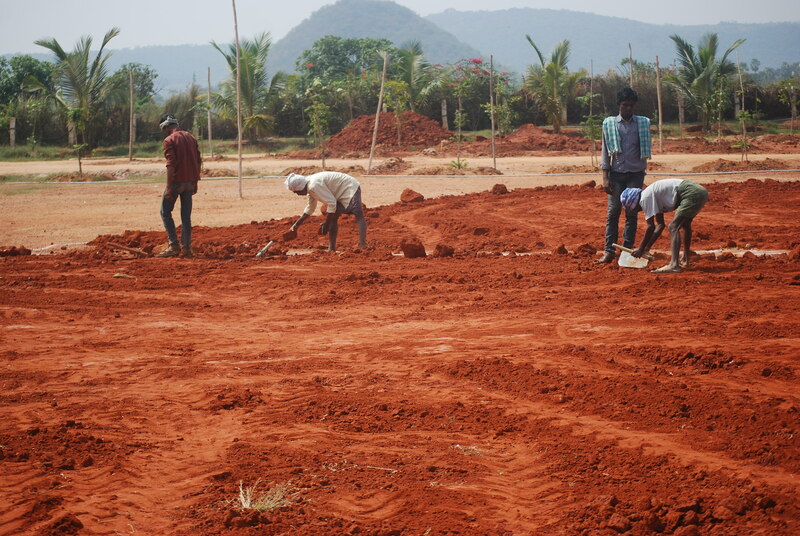 HEAL Paradise recently constructed two pitches, one for girls and one for boys. Though all the large stones and surface stones had been removed the surface was still quite bumpy and covered with small stones. Lots of people were cutting their knees and a quite a bit of blood was being spilt. So the arriival of six lorry loads of soft surface soild was a great sight to see. 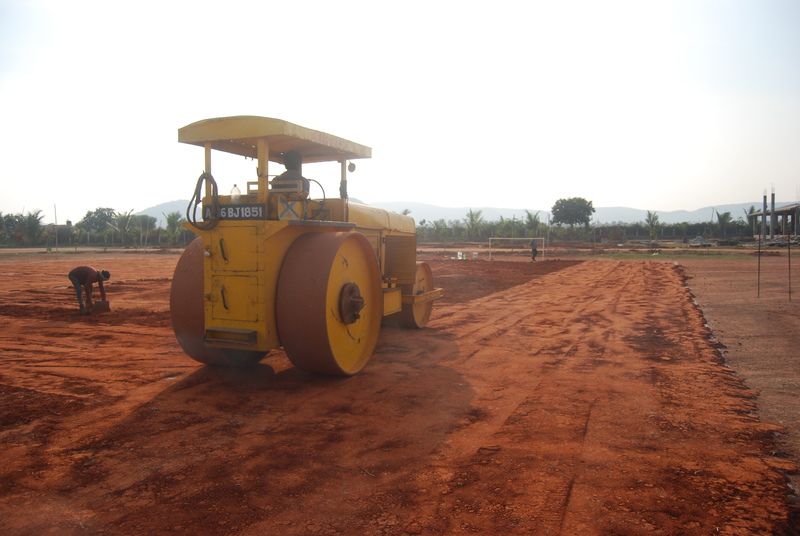 Workers soon spread the soft red soil across the surface of the pitch and a big yellow roller flattened it. 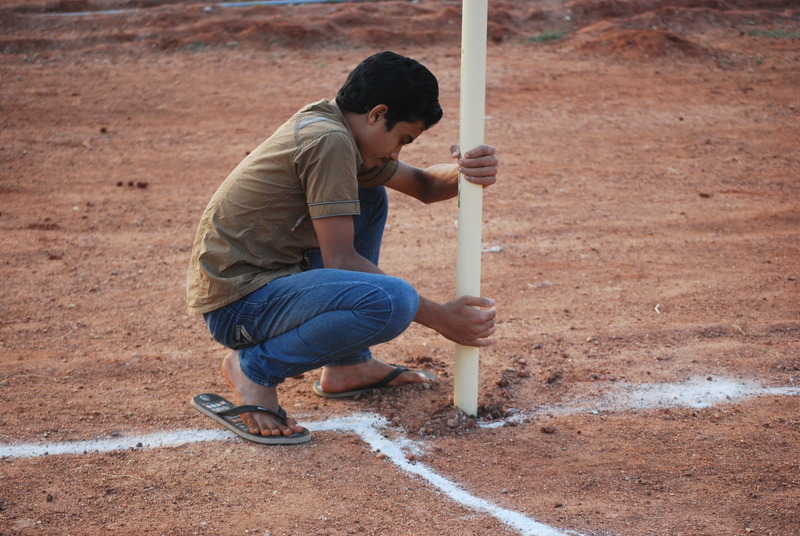 The boys remarked out the pitches and erected goals on both. 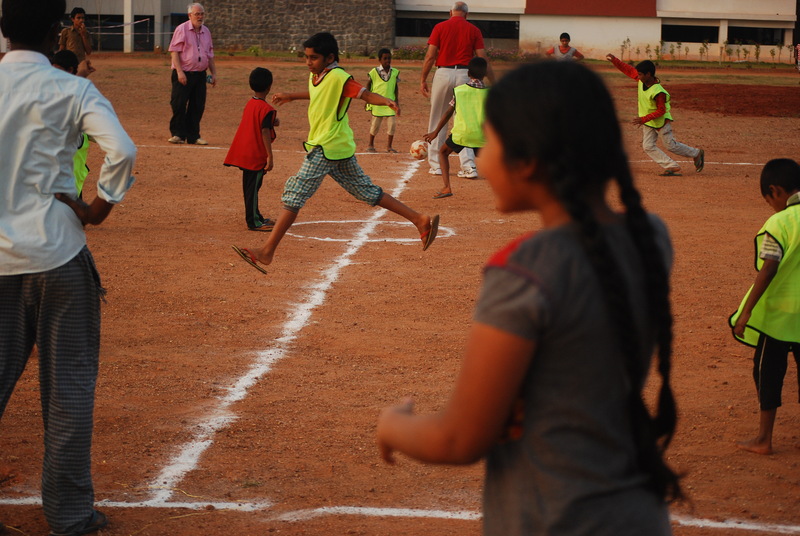 We now have a good soft surface to play on so our football skills should greatly improve and out injury rate decline. Maybe we will be able to get grass to grow on the pitch. For this to happen we will have to extend the irrigation. That will be a project for later in the year. 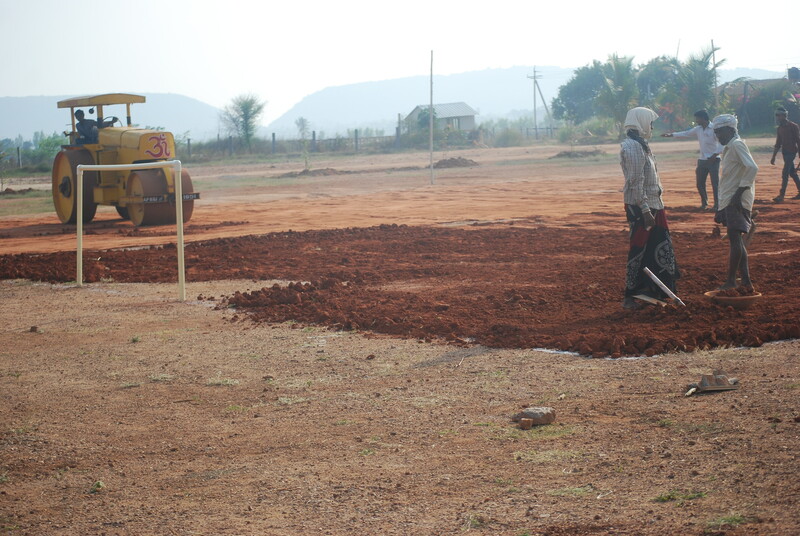 Following the donation of footballs and football kit by Liverpool Football Club, the children of Heal all participated in the preparation and construction of two junior football pitches- one for girls and one for boys. 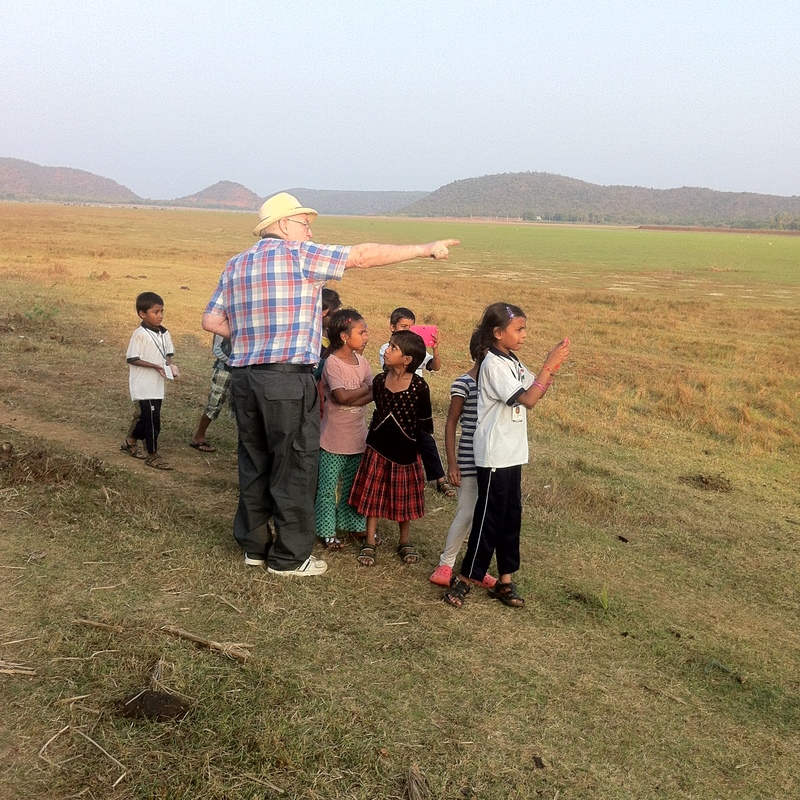 All the children in the school gave up their playtime on two successive afternoons, to clear the ground of large stones. 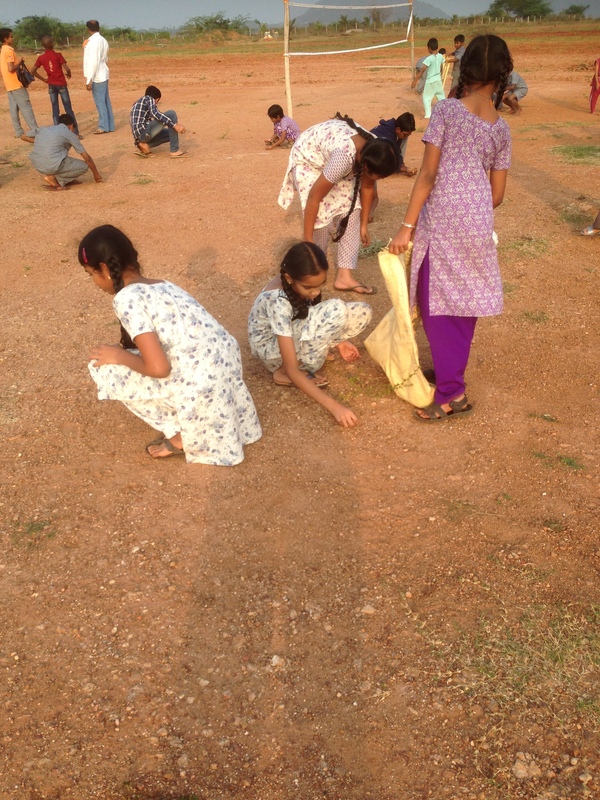 They used their initiative to find ingenious ways of extracting the embedded stones! Fifteen large sacks were filled. 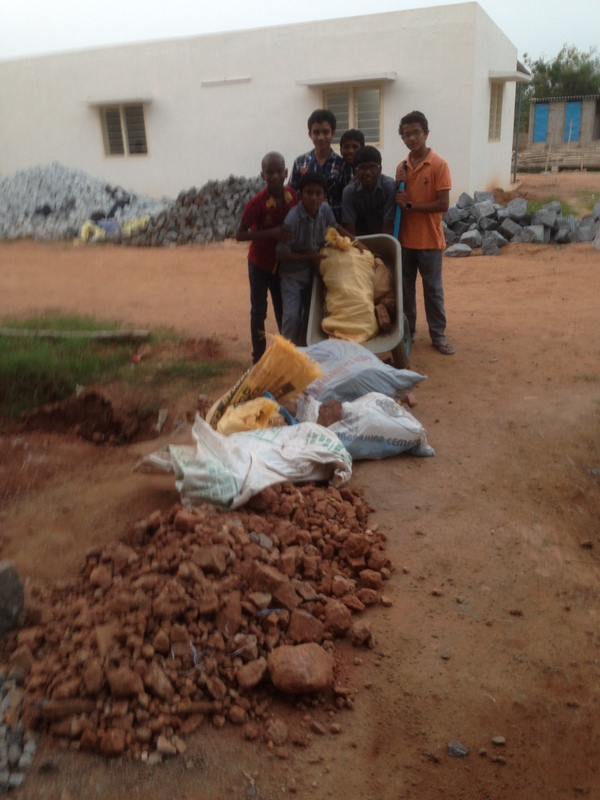 Four of the older boys used wheelbarrows to remove the sacks. 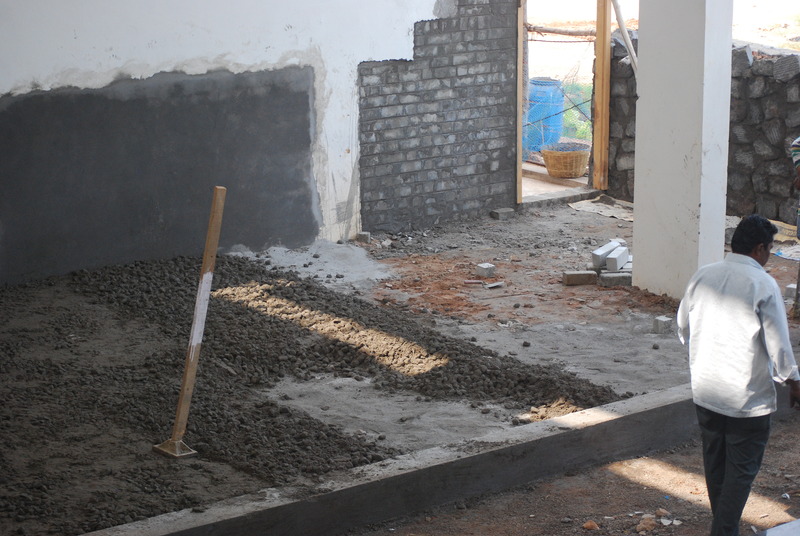 The stones were later reused as part of the foundations for the stage in the performance area, which is currently under construction. 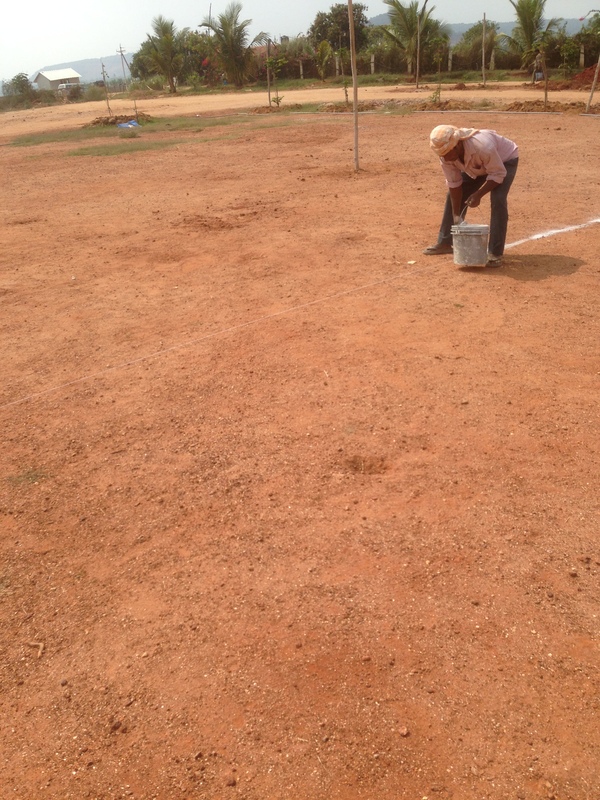 The pitches were marked using string and white powder. 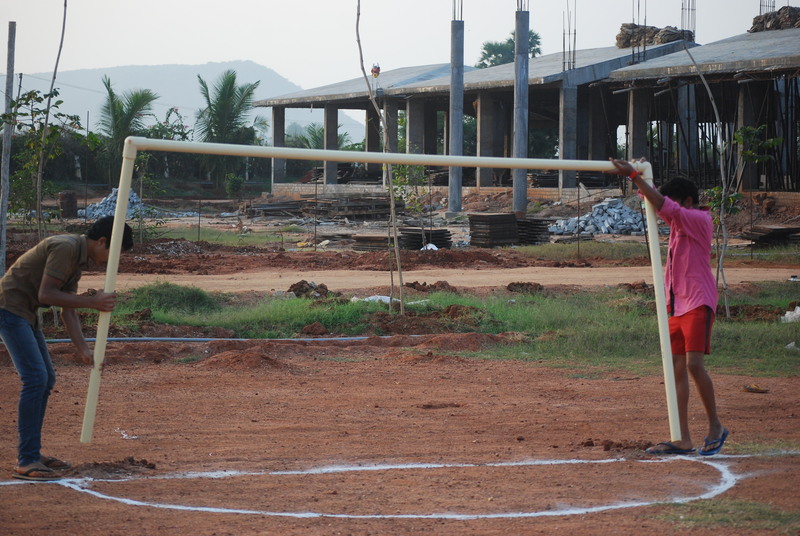 The children erected goalposts which had been constructed from plastic piping. 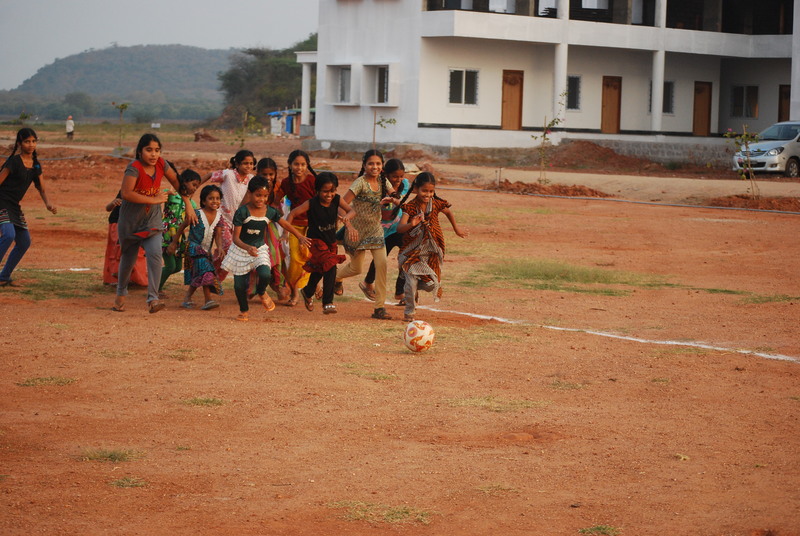 As soon as the goals were raised, the children enthusiastically took part in a football match. 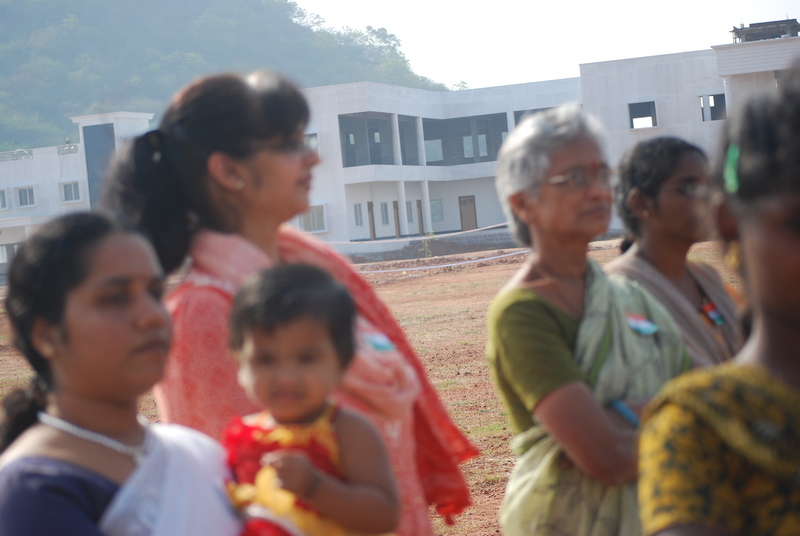 The girls initially had reservations but were soon just as enthusiastic as the boys. Most children wore flip flops or sandals and this highlighted the need to provide suitable footwear. 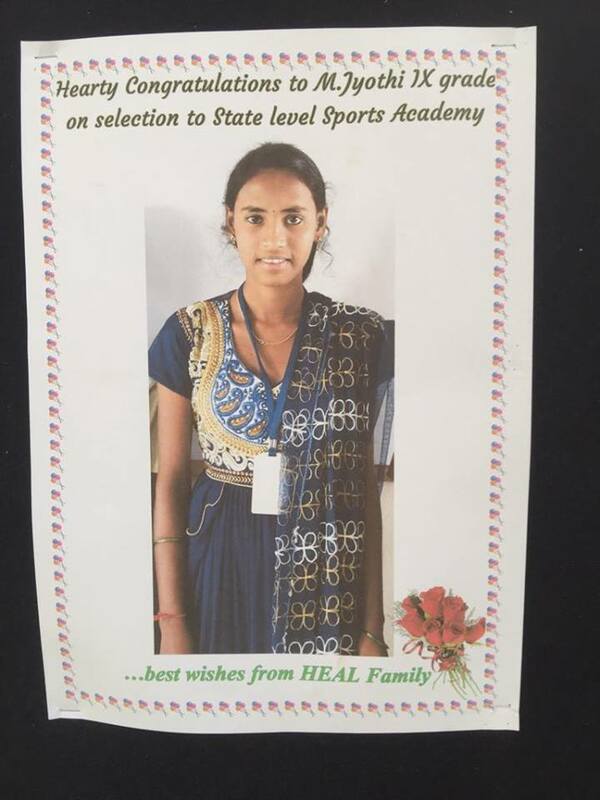 The success of this endeavour has prompted the purchasing of sport shoes for all the children as well as track suit bottoms for the girls. 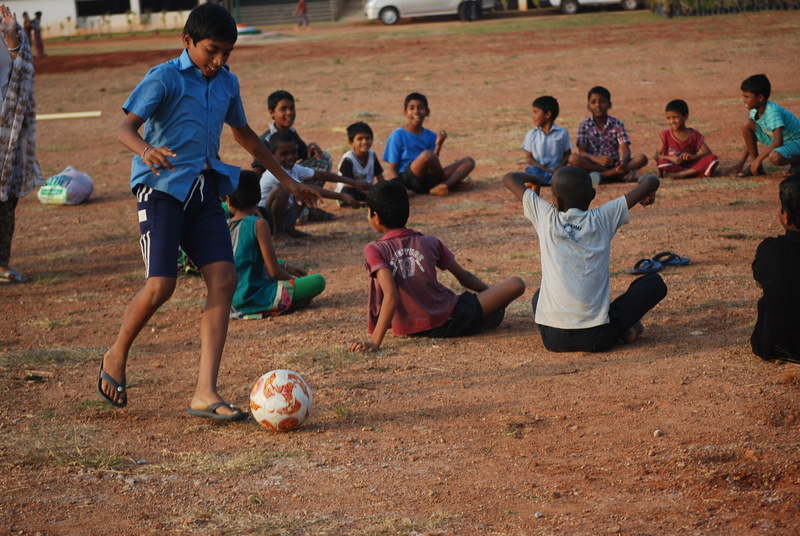 The rapid development of football skills is eagerly anticipated.